Crafted from the best barrel of the 2012 vintage, the 2012 Reserve Merlot is our first reserve release. Additional barrel age and bottle age enhance the black cherry, cassis, vanilla, toast, and cinnamon flavors. The addition of a small amount of 2012 Syrah, provides notes of pepper and toast as well as adding a silky structure to the blend. 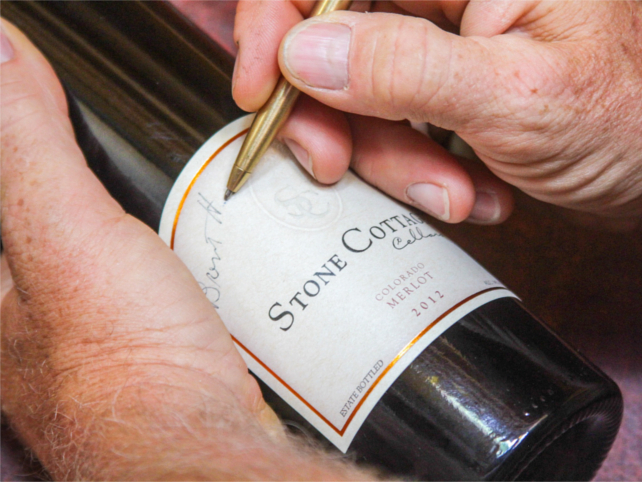 Each bottle is hand-signed by the winemaker and complements hearty fare such as Colorado beef, elk, and bison, or garlic-infused Italian dishes. As with our 2012 Merlot, the 2012 Reserve Merlot is sourced exclusively from our home vineyard at 6,200 ft. elevation. The painful decision, in mid-August, to cluster thin and drop one quarter of the crop on the ground, produced the quality of fruit that gave us the opportunity to craft a Reserve. The Reserve began life in the same way as the 2012 Merlot; a 4 day cold soak, inoculation with two separate strains of yeast, peak fermentation temperatures of 70 to 72 F and a 3 day post-fermentation cold soak. When tasting the barrels during aging, one barrel, a 1 year old Seguin Moreau crafted from Minnesota Oak, consistently stood out, displaying more depth, silkiness, and interest than the others. After returning to this barrel multiple times over the next 36 months, the decision to hold this selection back and bottle it separately was unavoidable. Bench trials with small amounts of 2012 Syrah blended in increased the smoothness and added subtle flavor components. Additional barrel age and nearly one year of bottle age prior to release have melded the components to one another resulting in a truly extraordinary, high altitude Merlot.